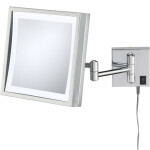 With its sleek minimalist look, the Single-Sided LED Rectangular Minimalist Vanity Mirror would add a perfect touch to any bathroom. 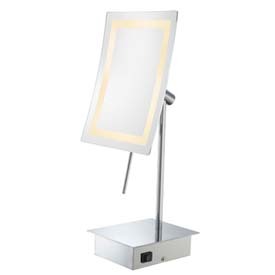 Its 3x magnification and 6.3” x 8.6” mirror, is surrounded by a bright, rectangular light that uses only a fraction of the electricity of a comparable incandescent light! Being only 15.63” tall, it can fit easily onto any counter. 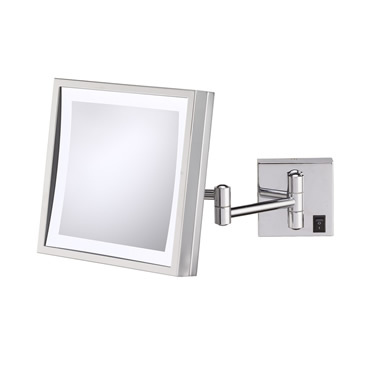 Available in Polished Nickel only. Closeout items are not eligible for warranty or return. 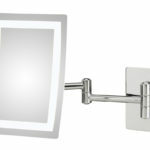 Aptations, Inc. Mirrors are warranted free from defects in material and workmanship. All metal finishes and reflective materials are fully warranted for an industry leading three years. This warranty does not cover damages resulting from accident after purchase, misuse, abuse, lack of reasonable care, loss of parts, or installation in showers. 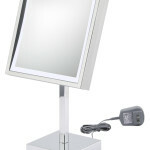 For lighted mirrors, this warranty does not cover the original light bulb beyond the “normal” lifetime of the bulb. Claims for damage occurring during shipment should be made to the freight carrier. The life of the finish will be best cared for, especially in areas of high heat and moisture, by keeping all surfaces clean and dry. Cleaning should be done with a non-abrasive cleaner and soft polishing cloth. Any alteration to merchandise automatically voids your Aptations Warranty Policy. 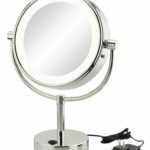 Aptations, Inc. mirrors are warranted to be free of defects in material and workmanship for three (3) years. This warranty does not cover damages resulting from accident after purchase, misuse, abuse, lack of reasonable care, loss etc. etc. etc. To stay up to dates on all the mirror news and happenings, just fill in your email and submit. Copyright © 2019, Aptations, Inc.